Researchers have known for some time that poor sleep raises heart disease risk. Now, they’ve found a chemical chain reaction that helps explain that risk, leading from poor sleep to a white blood cell surge that promotes the artery-clogging plaques of cardiovascular disease. The world’s top killer, cardiovascular disease kills 17.7 million worldwide annually, according to figures from the World Health Organization. It has been linked to a number of risk factors, including smoking, a poor diet, and lack of exercise. A less widely known risk is chronically poor sleep, whether short or fragmented, like that experienced by night-shift workers, travelers in the grip of jet lag, and sufferers of sleep apnea and similar conditions. “There are studies that suggest [sleep] can be as potent a driver of the disease as more traditional risk factors, such as smoking or high cholesterol levels,” said Cameron McAlpine, a research fellow in the lab of Filip Swirski, an associate professor of radiology at Harvard Medical School and a researcher at Massachusetts General Hospital’s Center for Systems Biology. 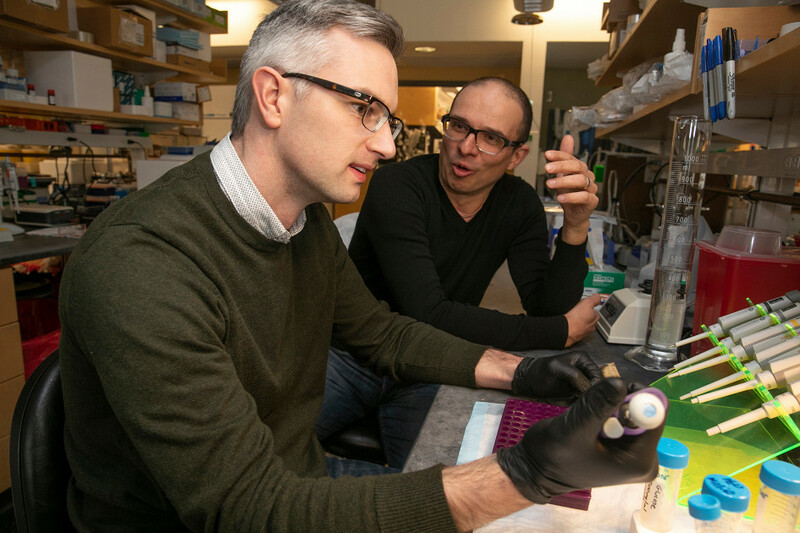 Four years ago, McAlpine, Swirski, and their colleagues began experiments designed to explore the connection between sleep and the immune and inflammatory mechanisms that play a role in atherosclerosis. Atherosclerosis, also known as hardening of the arteries, is a key feature of heart disease and has come to be understood as largely an inflammatory condition, McAlpine said. It typically advances with age as fatty plaques deposit along the walls of blood vessels, narrowing them and interfering with blood flow. The atherosclerotic plaques are made up of fats like LDL, or “bad,” cholesterol and white blood cells that flood to the scene and become entangled in fibers that hold the plaque together. The plaques not only reduce blood flow, they also can rupture and cause blood clots that clog arteries leading to the brain, causing strokes, or the heart, causing heart attacks. Through multiple experiments, researchers found that poor sleep causes production of a protein called hypocretin to fall in the brain’s hypothalamus region, which is responsible for wakefulness, energy levels, and sleep patterns. Low hypocretin levels stimulate the bone marrow to increase production of a second protein, called colony-stimulating factor 1 (CSF-1). CSF-1, in turn, signals the bone marrow’s blood stem cells to step up production of white blood cells, boosting the immune and inflammatory response that is a feature of the condition. In their experiments, conducted on mice fed a high-fat diet and genetically preprogrammed to develop atherosclerosis, the sleep-deprived mice had more white blood cells in their bloodstreams and developed larger plaques, and those plaques contained more white blood cells than those of control mice whose sleep wasn’t disrupted. Researchers then gave supplemental hypocretin to the sleep-deprived mice and found that the prevalence of atherosclerosis declined. The research, published in February in the journal Nature, was conducted with colleagues from Brigham and Women’s Hospital, Beth Israel Deaconess Medical Center, the Medical University of Vienna, and the University of Lausanne, Switzerland. It was funded by several sources, including the National Institutes of Health and the American Heart Association. Because these results were found in laboratory mice, Swirski said the next step is to search for a similar response in people. Ultimately, he and McAlpine said, the findings highlight the importance of good sleep hygiene, while the enhanced understanding of inflammatory mechanisms could provide new avenues of investigation for other conditions in which inflammation plays a role.